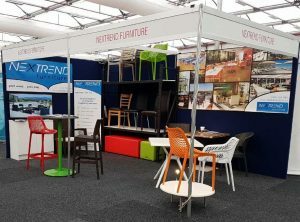 Nextrend Furniture is pleased to be an exhibitor at the Australasian Hospitality & Gaming Expo. The two days will be very exciting with over 250 stands. The 2017 Keno Australasian Hospitality and Gaming (AHG) Expo is hosted in the Brisbane Convention & Exhibition (BCEC). Visiting this show is the perfect way for everyone that is involved in the hospitality and gaming industries, clubs, pubs, restaurants, cafes and entertainment venues to keep up to date. Whether you are in the heart of Sydney or a few hours from town, we will bring our range to you! Book a visit from our Mobile Showroom.